RATES START AT $106 PER NIGHT PLUS TAX. The rates below are for up to 2 guests in a room unless otherwise noted and do not include tax. No rollaway beds permitted. Rates based on dates of stay. Wednesday, May 22, Thursday, May 23 and Friday, May 24 the rate for a Fairmont King or Double is only $106 per night plus tax. On Saturday, May 25 the rate is $193 plus tax. On Sunday, May 26, Monday, May 27 and Tuesday, May 28 the rate goes back down to just $106 per night plus tax. The longer you stay, the less your average nightly rate will be. Rates for dates before and after the group block are available at 10% off the best available public rate. ALL RATES INCLUDE COMPLIMENTARY STANDARD IN ROOM WIFI. 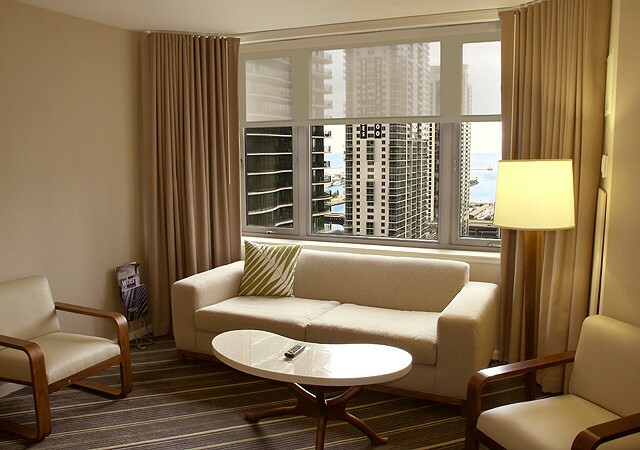 Immerse yourself in the “Urban Chic” embrace of the sleek, stylish hotel rooms at the Fairmont Chicago, Millennium Park . 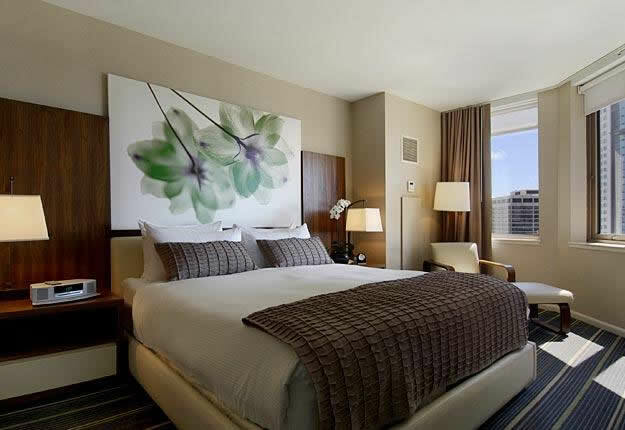 These spacious hotel rooms, among the largest offered in downtown Chicago, feature all of the luxuries and tech-savvy appointments of a private residence, including 42” flat panel televisions and exquisite marble bathrooms with rainfall-style showers. Same as the King room but with 2 Double beds. 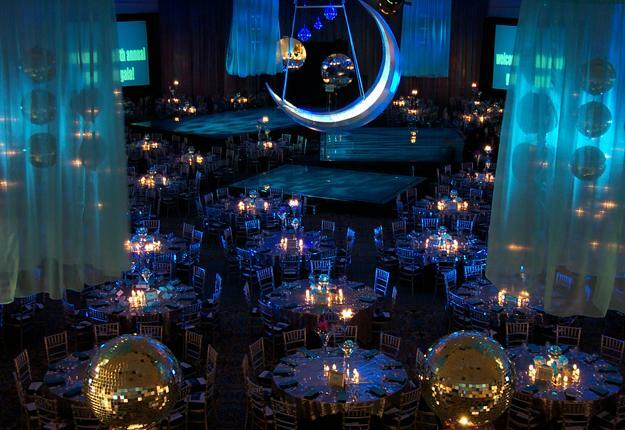 Event space and meeting rooms are available at the Fairmont Chicago, Millennium Park during the Grabbys Weekend. For more information and to book your special event. 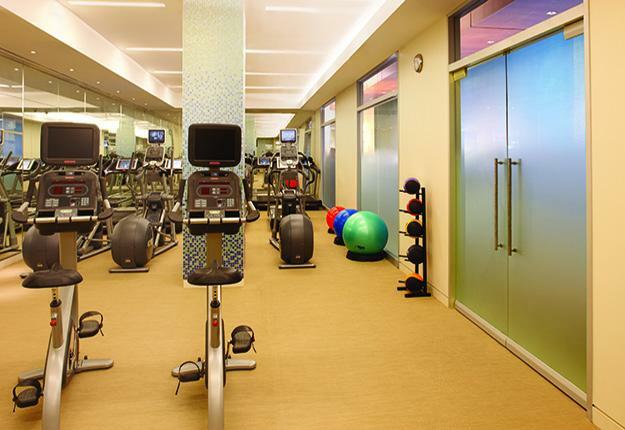 The full-service fitness studio at mySpa Chicago features a fully equipped studio with state-of-the-art cardio equipment, circuit training and free weights by Technogym and Precor. Located on the Spa Level of the hotel the fitness center is available to all guests of the Fairmont Chicago, Millennium Park for a nominal daily fee. Grabby Awards attendees enjoy complimentary access to the mySpa fitness facility compliments of Grand Luxe Travel. A limited number of luxury upgraded Deluxe Rooms, Fairmont Gold Rooms, 1 Bedroom Suites and SPECIALTY SUITES are available at The Fairmont Chicago, Millennium Park. These upgraded rooms and suites are at reduced rates, contact Grand Luxe Travel (VIP@GrandLuxeTravel.com) for more information. 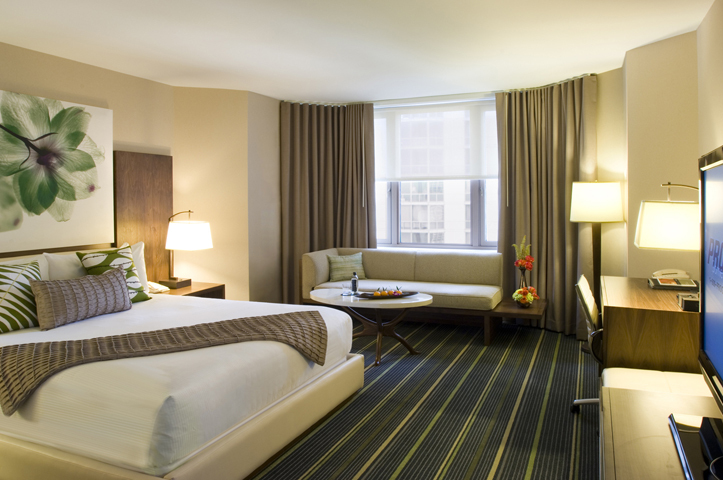 Deluxe guestrooms offer views of Chicago's legendary architecture, Grant Park, Millennium Park and Lake Michigan. Each of these spacious, beautifully-appointed rooms is available with one king or two double beds. The contemporary décor features subtle earth tones accented by pops of color from printed throw pillows and original floral artwork by renowned photographer Warwick Orme. Additional amenities include a 42” HDTV, luxury bedding and fine linens, spacious dressing area, marble bathroom with separate soaking tub and shower. Apartment-style elegance awaits you. Step into one of the chic Fairmont Suites at the Fairmont Chicago, Millennium Park and feel your stress melt away. The stylish design and sophisticated furnishings are perfectly complemented by captivating partial lake views from the bedroom and plush sitting parlor. Located in the heart of the hotel on the 14th to 17th floors, our Fairmont Gold Guestrooms offer contemporary accommodations offering one king or two double beds in a spacious 420-square-foot room. Enjoy a large, marble bathroom with a separate tub and walk in shower equipped with soothing rainfall style showerhead. Views from these luxury hotel rooms feature the downtown Chicago skyline, park and lake. 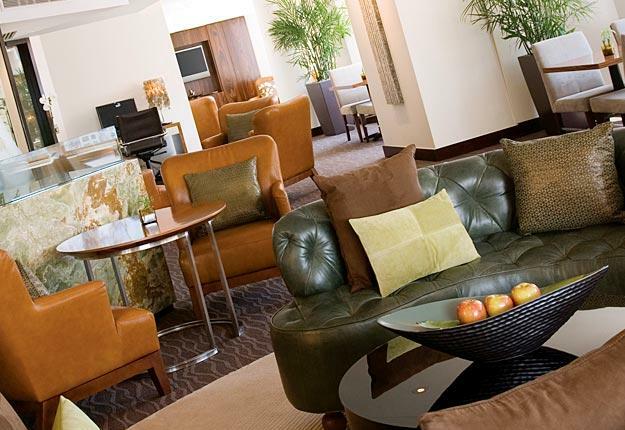 Private lounge on the 15th floor, exclusive for Gold guests available 6:00am - 10:00pm weekdays, 7:00 am- 10:00pm weekends. The Grabbys Committee has selected GRAND LUXE TRAVEL as the official travel agency for the host hotel of the "Grabbys" in Chicago, Memorial Day Weekend, May 22-29, 2019. 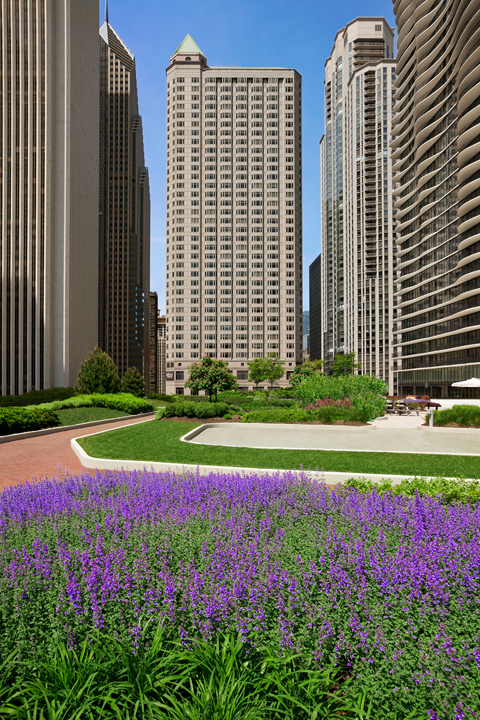 This year the host hotel is once again the luxurious Fairmont Chicago, Millennium Park. Reservations can be made using the provided room links. Grand Luxe Travel has negotiated a GREAT RATE depending on the dates you stay, for a Fairmont King room or Fairmont 2 Double room, double occupancy. The rates for the nights of Wednesday, May 22, Thursday, May 23 and Friday, May 24 are only $106 per night plus tax. On Saturday, May 25 the rate is $193 plus tax. On Sunday, May 26 Monday, May 27 and Tuesday, May 28 the rate goes back down to just $106 per night plus tax. The longer you stay, the less your average nightly rate will be. 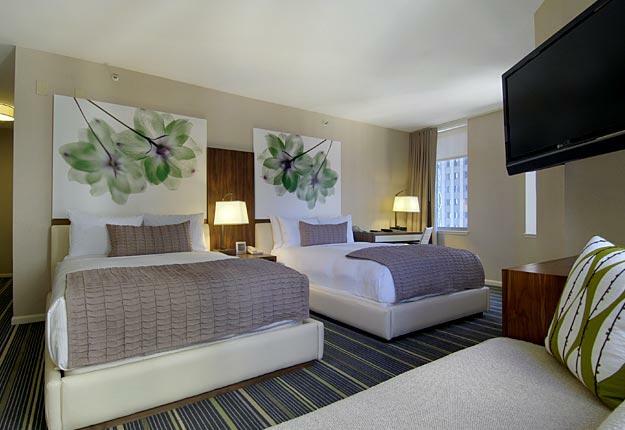 Room rates include complimentary standard in-room WiFi and access to mySpa Fitness Center courtesy of Grand Luxe Travel. IF THE DATES AND ROOM TYPE YOU DESIRE ARE NOT SHOWING AVAILABLE PLEASE contact David Arias at Arias@GrandLuxeTravel.com. Come to Chicago two or three days early and attend ALL THE GRABBYS EVENTS! Grabbys sponsored parties start on May 23 and continue until May 27. Car or limo service is available from either ORD or MDW. Contact David Arias at VIP@GrandLuxeTravel.com for rates and reservations. We	use	NATIONAL	RENT	A	CAR for the BEST rates and service. Parking at the Fairmont Chicago, $70 per night. Getting to the Blue Line from Terminals 1, 2 or 3: The O’Hare station is situated in the lower level concourse, which connects Airline Terminals 1, 2 and 3, and is conveniently accessed from Terminal 5 by free, frequent airport shuttle trains. Follow signs in the airport to "CTA Trains" or "Trains to City." These will lead you to the train station. You can walk from the baggage claim to the train in under ten minutes from any of these three terminals. Terminal 5 arrivals must take the Airport Transit System to Terminal 2 then follow the signs. Take the Subway - Blue Line - Direction: "Forest Park". Get off at Clark/Lake Station and walk east on Lake Street 6 blocks to N Stetson Avenue. Take the Pedestrian Walkway up to The Fairmont. Total travel time approximately 48 minutes. If the Pedestrian walkway is closed at N Stetson, then turn left on N Stetson then the first right, East South Water Street. Proceed east to Columbus Drive and turn right. The hotel entrance is on the right. Getting to the Orange Line from the Midway Airport Terminal Building: The Midway station is situated just east of the airport terminal building and is connected to the airport via an enclosed walkway. Follow the signs to “CTA Trains” or “Trains to City” from the airport. An orange line painted on the ground will guide you there. Take the Subway- Orange Line - Direction: "Loop". Get off at State/Lake Station and walk east on Lake Street 3 blocks to N Stetson Avenue, turn left. Take the Pedestrian Walkway up to The Fairmont. Total travel time approximately 47 minutes. Most Grabbys events will take place in Boystown, a short subway ride on the Red Line. Getting to the Red Line The Lake Station is located 4 short blocks from the Fairmont Chicago. Exit the main lobby of the Fairmont and turn right, use the Chicago Downtown Pedestrian Walkway System (PEDWAY) to Stetson Avenue and Lake Street. Walk west 4 short blocks to State Street. Cross Lake Street and the entrance to the Lake Station Red Line is just past the southeast corner on State. The elevated rail or EL will not get you to Boystown. Take the Subway- Red Line - Direction: "Howard". Get off at Belmont Station and walk east to Halsted Street. To return to the Fairmont Hotel from Belmont Station take the Red Line Direction: "95/Dan Ryan". The Red Line runs 24 hours a day with night owl service. Otherwise we recommend taking UBER.